We are fortunate in the park to have one of the best displays of Greater Butterfly Orchids (Platanthera chlorantha) nationally. This plant with its lovely vanilla coloured flower spikes grows in old meadows and other unimproved grasslands and during the months of June and July appear in the in large numbers. During July we held two successful orchid events which were both quite different but closely related. Country Park. The Friends Group organised an Easter Trail which proved really popular. So much so that it took us by surprise and unfortunately a few were disappointed when the eggs ran out temporarily. Definately a lesson learned for next year.We hope it did not spoil the day too much for the children.The fun continued as the egg decorating and Easter Bonnet competition got under way with a large number of entries. A huge amount of effort had gone into both decorating the eggs and creating the hats. This made the judging a very difficult task. 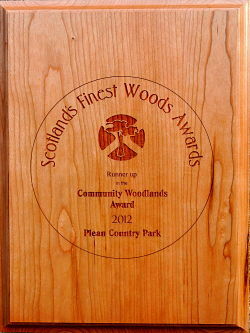 The first AGM of the Friends of Plean Country Park took place in the Park on 8th May 2012 at 7:00 in the evening. It was a fine evening, if rather cold, and the excellent barbecue prior to the meeting was much appreciated. The Minutes of the AGM are now available on the website. If you have already registered with our website you can view the Minutes via the Minutes link in the More Information menu on the left. Otherwise why not register via the Login Form and join our website to view the minutes and other information available to registered users. Our weekly health walks featured in the April issue of the newsletter published by the Scottish Countryside Ranger Association. The Monday health walks, which are led by the Friends of Plean country Park, have started their third season. The first walk took place on the 5th March this year. During December, January and February many of the paths are very muddy and can be a bit dangerous so we give ourselves and the paths a rest.We had a gorgeous day for our first meeting of the year and a great turnout with seventeen walkers returning from last year and two new walkers joining the group.